Spur Straps are 18” and have double loops. Straps are available in Black and Havana. 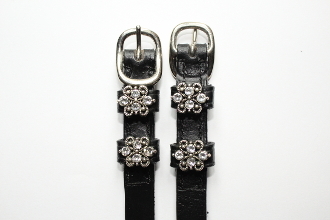 There are 2 stones on each strap and a total of 4 stones per pair. Please note that most designs come in other colors.Pleas choose from the Mariposa Color Choice Menu to see if the color your looking for is available any questions, please feel free to call (732) 740-8300.